Last night Chuck and I were invited over to a wonderful meal at our new friend's home. 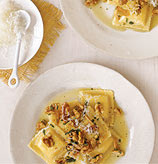 They cooked a phenomenal dinner of this roasted walnut ravioli (pictured on the left, recipe below!) salad with homemade dressing, and french bread with olive oil and vinegar. Oh and a fabulous Merlot to top it off. A few things struck me about our meal that I thought I'd reflect on a bit. To me, our hosts were the picture of hospitality, candles were burning, soft music was playing, red wine was open, dinner was cooking when we arrived. After a long day, it was so peaceful walking into their home. I realize it's not always possible to have everything cleaned up when guests arrive, but I also realize how peaceful it makes the environment if that is possible. I realized how warm and inviting a nice table spread can appear--dishes, accented by colored serving bowls with a candle burning in the middle made the table so inviting. (Ok I am spending a lot of time researching dishes and serving platters these days, so I am more aware of them!) But what struck me most was the way Nick and Whitney genuinely wanted to get to know us. We sat down and they began asking us questions about how we met, how we got engaged, how wedding planning was going etc. They asked us about our upcoming church transitions, as we look to find a place for us to worship together. And they asked how they could support us in that transition. We laughed over coffee, learned a new and ridiculous card game, and even ran to Cal Tech to catch the end of the boy's basketball game so Chuck could support one of the college students in his small group. We left their apartment last night and the first thing I said to Chuck was what a gift this couple has for hospitality, and how I want to work at developing that in our home. I long for our home to be a place where people can enter and feel at peace. I desire to have an apartment that no longer looks like a college student's home but feels like a "grown up home." (Granted, in our 1 bed room this probably won't be fully possible with us needing to store Chuck's 3 giant surf boards in the living room...but one day I am determined to have a garage where he can keep them!) I think hospitality, sharing life with people, takes intentionality and work. I think it's something we don't practice much in our busy lives today, but it's my hope and desire that this would be different! Even in a "college kid" apartment you have this mastered my dear! And with your mom as a role model you have learned from the best. Hope you are having a great day!